Bangalore’s storytelling scene is burgeoning, with several clubs springing up in the city in the last two years. Whatever their function and their background – some of these clubs exist for children, some for “children of all ages” – at their heart is a love for the narrative. Deeptha Vivekanand founded Ever After in 2012 as a way to encourage learning and critical thinking through the stories that surround us all. Ever After conducts storytelling workshops, summer programmes, and performances. We know we’d love to try Bake A Tale, a workshop in which participants (aged 7-10) can bake their story and eat it too. Check out their webite here. 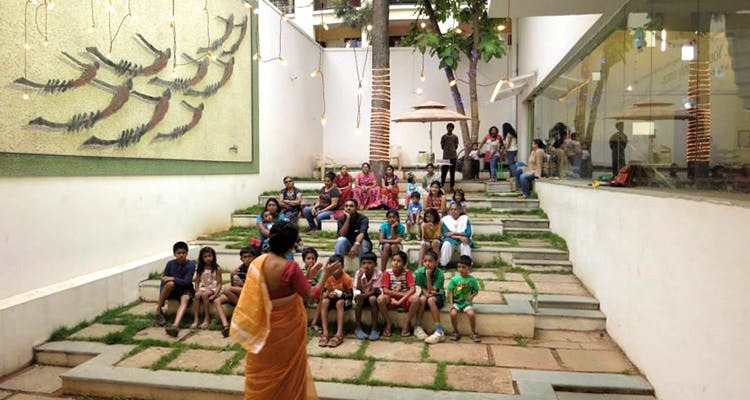 Founded in 2013, the Bangalore Storytelling Society is dedicated to oral storytelling, and carry out a range of activities to promote and revive the form. They also run an active Meetup group, which is open to entry. Run by the inimitable Geeta Ramanujan, Kathalaya has been a home for stories since 1998. It has since blossomed into a “storytelling academy”, offering storytelling training to students, actors, journalists, and people from various other backgrounds. They also coordinate the Indian Storytelling Network, which acts as a hub of all storytelling-related activity in the country. Storipur specialises in using storytelling as a means to all sorts of other interesting ends: building community, encouraging learning, or creating a sense of social responsibility. Founded in 2013 by Priya Muthukumar, Storipur’s sessions are intended for everybody, not just children. Contact: +91 9611075804/ 9902099702, or email priyastoripur@gmail.com. Ameen Haque’s outfit trains businesses and teachers in storytelling, and conducts storytelling performances for the general public and underprivileged children. The Storywallahs are firmly rooted in the ethos that stories are more than just entertainment but actually a tool for change. Katharangam trains teachers in storytelling, conducts open-mic sessions in which anyone can share a story, and reaches out to underprivileged children with storytelling sessions. Shreya Biswas, the force behind Katharangam, is a multilingual storyteller: her stories come in English, Hindi, and Bengali. Katharangam also coordinates story clubs in schools. Contact: +91 9900234613, or email piubiswas67@gmail.com or shreya@katharangam.com.